Whether we like it or not, fair skin is in! We just need to have a look at the market shelves bearing beauty products in any cosmetic products outlet. Right from a moisturizer to soap to face wash, every other product claims to be laden with capacity to provide flawless fairness. However, even as we all would love to be the proverbial ‘fair n lovely’ beauty, we would not like to harm our skin with harmful ingredients and chemicals. It would always be better to use products with more natural ingredients than not. The burning sensation is not limited to the skin, it also sometimes causes burning in the eyes and leads to teary eyes. Yet, bleach is an important part of our beauty regime and along with waxing, threading and cleansing, it cannot be done away with. It not only masks the appearance of fine hair on the face and neck, it lightens the skin tone and makes you look fairer and brighter. It is also a cost effective way of getting a lighter skin tone. Among the ingredients in skin bleaches is ammonia that is considered harmful to the skin. What if you could keep the goodness of a bleach and do away with ammonia? Saffron has for centuries been known for its skin lightening ability and has been used in various forms in different ages for its benefits to the skin. 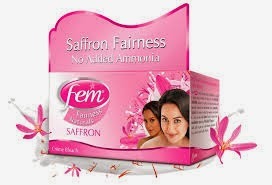 Dabur’s FEM fairness naturals bleach is the first skin bleach to use saffron rather than ammonia to lighten the skin. Fem Fairness Naturals Pearl for darker skin, Fem Fairness Naturals Gold Bleach for special occasions and Fem Turmeric Herbal Bleach. Acting in a natural and soft way, the cream bleaches the facial hair around your cheeks, on the upper lip and is not harsh on the skin and the eyes. The bleach not only effectively bleaches facial hair, it also removes tan on the skin. Other products that claim to lighten skin include creams that also come with bleaching agents. While there is nothing wrong in desiring a lighter skin tone, but make sure you chose the right product. No more teary eyes, no more burning to the skin, when it comes to bleach, you can go natural now.